EVANSTON, Ill., September 11, 2018	(Newswire.com) - ​​​​Nova Techset, the publishing services division of Katalyst Technologies Inc., today announced details of its new data conversion services partnership with bioRxiv, Cold Spring Harbor Laboratory’s preprint server. Nova Techset – Katalyst will deliver content to the bioRxiv server in full-text XML, which will be fully searchable by readers. bioRxiv (pronounced ‘bio-archive’) is a free online archive and distribution service for unpublished preprints in the life sciences. It is operated by Cold Spring Harbor Laboratory, a not-for-profit research, and educational institution. By posting a preprint on bioRxiv, authors make their findings immediately available to the scientific community and may receive feedback on the manuscript before it is submitted to a journal. 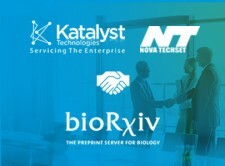 Nova Techset-Katalyst has been chosen by Cold Spring Harbor Laboratory to provide full-text XML conversion services for all bioRxiv manuscripts posted since the server’s launch. Full-text XML means that each article will be fully searchable, both within itself and throughout the entire archive. Nova Techset-Katalyst has worked for Cold Spring Harbor Laboratory Press for over ten years on its book and journal publishing program and was chosen by CSHL because of its track record of success. The bioRxiv preprint server was initiated by Cold Spring Harbor Laboratory in November 2013 and received significant support in May 2017 from the Chan Zuckerberg Initiative. It currently hosts over 31,000 manuscripts from scientists in 108 countries and has a rapidly rising rate of submission. Nova Techset – Katalyst is a leading supplier of prepress services to the STM and academic publishing world. It provides pre-editing, copyediting, composition, software development, and ePub solutions, as well as a full range of project management services. Formerly, Nova Techset is acquired by Katalyst Technologies Inc., a best-in-class software, technology services, and solutions provider to multiple industries and geographies. Katalyst’s core areas of expertise are ERP, supply chain, engineering, digital & e-commerce, and publishing services. The End to End Solution for your Enterprise Needs. Katalyst is one of the fastest growing IT companies in Chicago and was just named recognized as one of the 100 Best Workplaces for Millennials in 2016.